Are you planning a large event or the construction manager for a large building site? If the facility or lot isn’t already equipped with restrooms, then you’ll need to make arrangements for temporary facilities such as porta potties, or restroom trailers. Our military level of cleanliness, a large inventory of porta-potties and other temporary restroom facilities, as well as over 50 years in the sanitation, septic maintenance, and waste removal industries, make us the one to call. We take the odor out of a potentially smelly situation by maintaining your porta-johns and septic tanks. 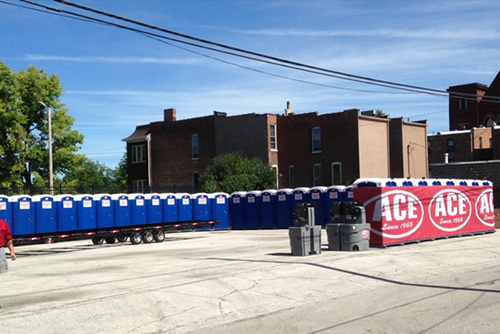 ACE Sanitation provides delivery and cleaning of porta-potty products for construction sites, festivals, backyard parties and special events, including: luxury restroom and office trailer rentals, freshwater systems, grey water tanks, hand wash stations, trash boxes, tie downs, containment trays and lift slings. A properly maintained septic system will provide you with worry free sewage management for many years. While health departments suggest three years between septic tank cleaning & pumping, many factors affect frequency. 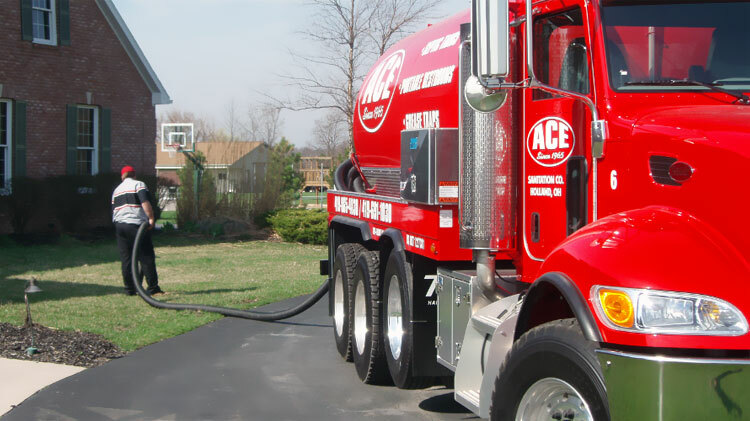 ACE’s no worries program includes reminders when it’s time for your septic tank service. To maximize the life of your grease trap, we recommend you have it power washed regularly; clearing all debris from the bottom of the tank and side walls. Standard during the cleaning and pumping process, ACE Sanitation technicians inspect the tank for cracks and wear to keep it in good working order. From our Holland, Ohio warehouse, we supply crowd control barricades to support special events where you need to keep participants separated from spectators for safety and/or course framing. ACE also stocks temporary fence panels and portable fencing to support your construction site, or other project needs. 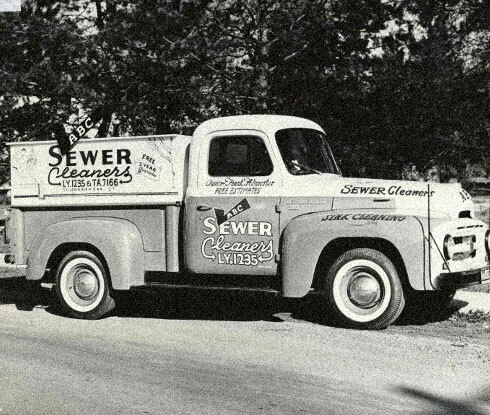 As a whole, ACE Sanitation is proud of it’s long and varied history as part of the Toledo Metro community. We are pleased to have remained a family-run company for more than fifty years. 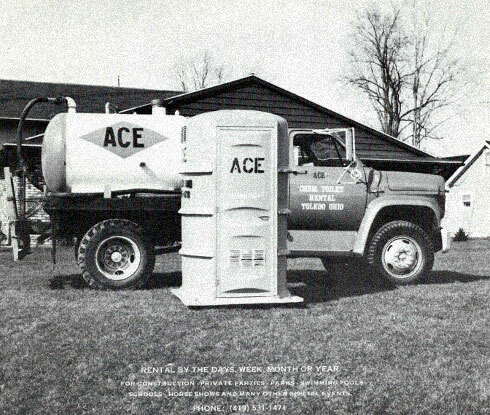 ACE Sanitation has been servicing Northwest Ohio and Southeast Michigan for over 50 years. 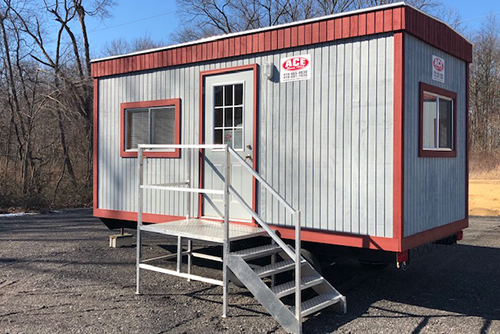 We have been providing portable restroom rentals (porta-potties / ports-johns), restroom trailers, septic tank pumping and maintenance, and grease trap cleaning services at value that continues to exceed our customers’ expectations. Our mission at ACE Sanitation is to provide our customers with quality service and a well-maintained, readily available fleet of porta-johns and equipment — and uphold integrity to our customers, suppliers, community and competitors. 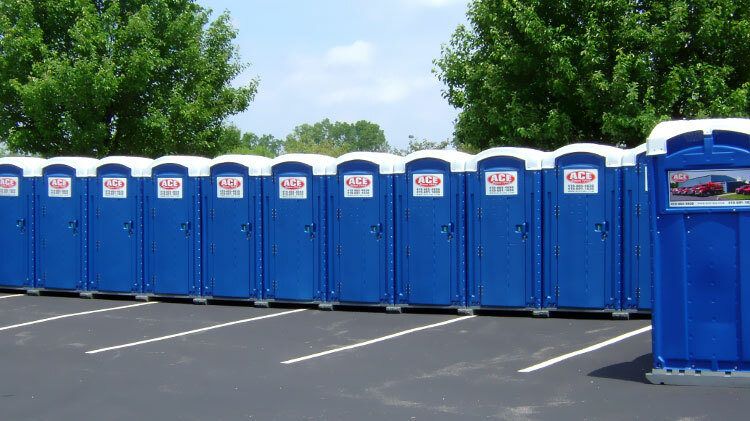 Call us today — We can help you plan your special event, residential needs, or supply your construction site with porta-john and fencing services. We have developed our process over a half century, making our service second-to-none.  Our professional staff will also help you properly maintain your septic tanks and grease traps. 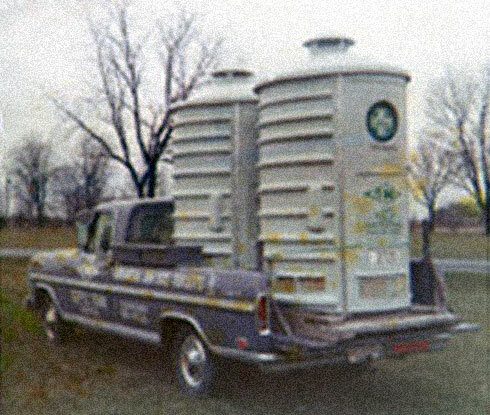 With the help of his wife Dolores, Frank founded Ace Sanitation in 1965. The first portable restrooms were made of wood and extremely cumbersome then. It took two people to lift them in and out of the pick-up trucks. 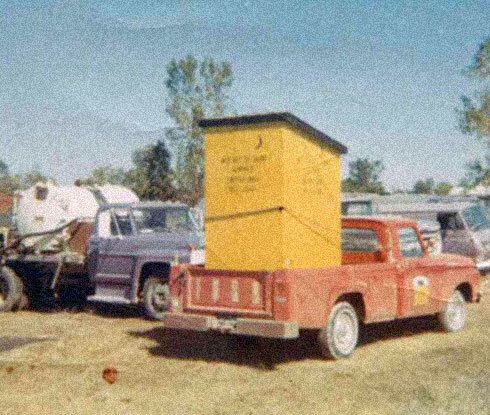 In 1968, the first fiberglass and plastic porta-potties were introduced. These units were more durable and lighter. 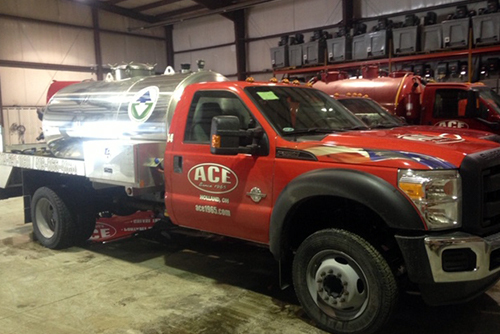 For the comfort and satisfaction of our customers, ACE Sanitation continues to keep up with industry advancements. The evolution of porta-potties continue with the plastic model that is closer to the version you will see in use today. Taken in 1975, this picture also shows the modern trucks that were being added to our fleet at that time. Frank M. Almester passed away in 1988 and his son, Frank S. Almester took over the business. Frank S. has worked at the family company since he was 13 years old and is proud to carry on the family tradition. If your construction site does not have access to restrooms, or additional facilities are required, ACE is the place to call for fast, friendly delivery and maintenance. ACE Sanitation provides a complete line of clean, newer, fresh smelling porta-potties and restroom trailers, as well as handicap accessible restrooms and hand-washing stations. You can also look to ACE to supply, deliver, erect and tear down temporary fence panels. If your personnel needs are taken care of, and your construction site is protected, your project productivity will increase. At ACE, we pride ourselves on helping you meet the unique requirements and logistics of basic to the most complex construction site. Homes in many rural and outlying neighborhoods and subdivisions utilize septic tanks to collect and store their sewage. A septic tank is a settling basin in which solids accumulate at the bottom and are gradually broken down over time. Scheduling regular septic tank pumping is important for removing build up and extending system life. If not performed, your septic tank can overflow and cause costly damage. ACE Sanitation takes all worry out of the process. Additionally, the grease traps used in kitchens and restaurants capture grease that builds up in wastewater. 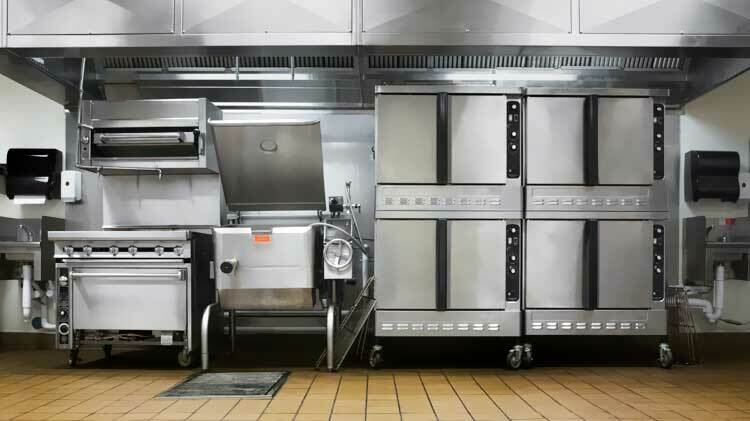 The use of grease traps is standard per health and safety codes in most commercial food preparation applications. Regular cleaning and inspection is necessary for maintaining a working and up-to-code system. Are you planning a special event, wedding, backyard or block party, large gathering, running race or triathlon and want to accommodate all attendees restroom needs and your the setup and management of your setting or race course? ACE stocks the sanitation and fencing products for making your event a success. Provide visitors with access to clean, safe, and properly disinfected portable restrooms. ACE will include regular service, appropriate quantities, and accessible placement of the sanitation products for your event. 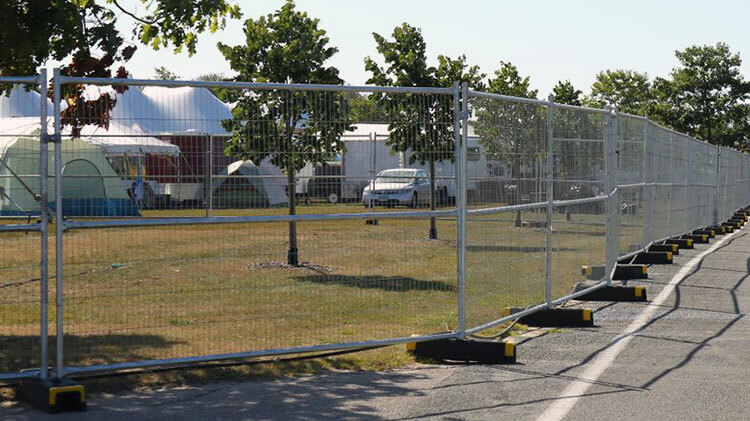 We will also deliver, setup and tear down the necessary fencing or barricades for your event specifications. With over fifty years of service, ACE has the expertise and infrastructure to handle minimal needs to events of thousands of people. Wherever people do their business, ACE Sanitation does business. We pride ourselves on our cleanliness. And all our trucks are equipped with GPS, so that we can get to you quickly. Plus, we provide military discounts and senior discounts on septic services. Use this guide as a reference, but please call us for assistance.